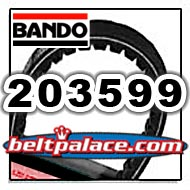 BANDO 203599 (A-DF), BANDO Hi-Performance belt for Comet 30 series. OEM Comet Industries Belt 994-130. Home > COMET INDUSTRIES BELTS > COMET 203599 (A or DF). OEM BELT 994-130 for Comet 30 Series. 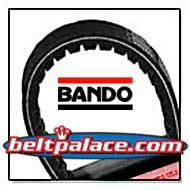 > BANDO 203599 (A-DF), BANDO Hi-Performance belt for Comet 30 series. OEM Comet Industries Belt 994-130. BANDO 203599 (A-DF), BANDO KEVLAR Hi-Performance belt for Comet 30 series. OEM Comet Industries Belt 994-130. BANDO KEVLAR 203599(A/DF), Comet/Salsbury 203599A Go Kart belt. BANDO 203599-A and 203599-DF. BANDO Hi-Performance 203599-A/DF. This Heavy Duty Go Kart torque converter belt measures 3/4” Inch Width, 39.77" Length OC. Asymmetric Cogged belt. For use with Use with 6" Dia. Lower Pulley (30D)with 13-1/16" to 13-1/8" center to center distance or with 7" Dia. Lower Clutch with 12-1/8" - 12-3/16" center to center distance. REPLACES: Belt used in Ken Bar SK 959, ATV Belt 203599A, Comet 203599-DF, Mini-bike Belt 203599A. COMET 203599 (A or DF). OEM BELT 994-130 for Comet 30 Series. Comet 203599 (A-DF) Go Kart Belt. COMET INDUSTRIES belt for Comet 30 series. OEM COMET 994-130. COMET 203599 and 203599A/203599DF. Comet 216168A - Single Pack "Yellow" 30 Series Driven Clutch Torsional Cam Spring. Comet 216168A - Single Pack "Yellow" 30 Series Driven Clutch Torsional Cam Spring, 30 Series/TAV2 Yellow Cam Spring. Comet 219457A - 7" Driven Clutch (5/8" Bore) for Comet Industries 30 Series (Asymmetric). Yerfdog #Q43200W. Comet 219457A Driven Clutch. COMET INDUSTRIES MODEL 31D-7, 5/8" BORE, REPLACES 217611A. Comet 30 Series Driven (lower) Pulley. 7" Dia., 5/8" Bore, 3/16" Keyway. Manco Part 8191 (7” Dia. DRIVEN 30S-7, #217611).